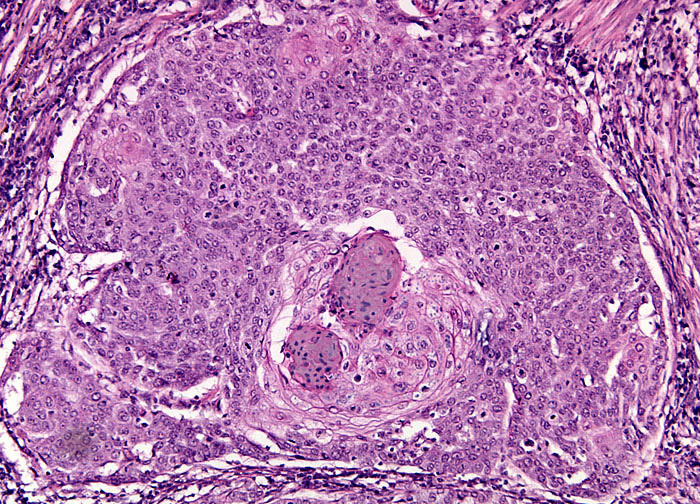 If caught early enough, squamous cell carcinoma is readily curable. In such cases, the cancer is usually removed through surgical excision. However, depending on the location and other characteristics of the cancer as well as the patient’s general health, a number of alternate treatments, such as radiation therapy, laser therapy, micrographic surgery, cryosurgery, or electrodessication and curettage, may be utilized instead. If left untreated, squamous cell carcinoma can cause significant damage by invading surrounding tissues. Also, there is a risk that the cancer will metastasize to internal organs or other regions of the body, which greatly increases the incidence of serious health effects and even death. Therefore, any visible lesions that refuse to heal or repeatedly recur should be examined by a medical professional.